With £7750-worth of extra kit provided as standard and a body slim enough for country lanes, will the Hobby Optima De Luxe V65 GE take Britain by storm? German firm Hobby is the world’s largest manufacturer of touring caravans, which in 2014 formed 88% of its total output of leisure vehicles. One of Hobby’s unique selling points in the caravan market, we’re told, is the inclusion of all-inclusive kit lists, saving buyers money and leaving them wanting for little. This successful strategy has been rolled out into Hobby’s motorhome portfolio for the 2016 touring season, and is available in all three line-ups: Vantana van conversions, Optima low-profiles and Siesta overcab coachbuilts, all denoted by the ‘De Luxe’ designation. De Luxe buyers benefit from approximately €10,000 (£7750) worth of spec bumps, the lead items of which include LED daytime running lights, cab sunroof, a rear garage door on the driver’s side of the vehicle, pull-out gas bottle rack and a wind-out canopy awning. Optima is Hobby’s core motorhome offering for the 2016 touring season. Ten models are available: two in 2.16m-wide V (van) flavour, and eight in the 2.33m-wide T (low-profile) form. Buyers shopping for a compact motorhome that’s little wider than a van conversion should certainly find these two narrow-body V models of interest. What’s more, alongside the French bed V60, the V65 packs on-trend rear twin single beds – a floor plan that permits night-time washroom visits without you having to disturb your partner. 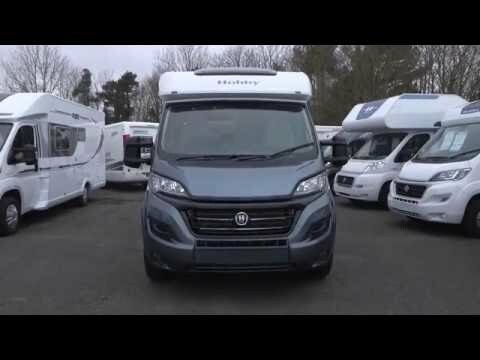 Browse older Hobby motorhomes for sale to compare them to the 2016 range. Our Hobby Optima De Luxe V65 GE test ’van was supplied with the optional slate grey cab. This looks particularly attractive, with the black radiator grille and headlight cluster surrounds, and is referenced in a slate grey band on the habitation sidewalls. Further co-ordination is in evidence with the optional ‘Premium’ rear panel, ported over from last year’s range (now discontinued), which has a grey section at the top and an integrated strip of automotive-style road lights towards the bottom. Choosing this rear panel comes down to personal taste, but it does make the rear of the vehicle feel well integrated. Based on the Fiat Ducato with a 2.3-litre turbodiesel engine and six-speed manual gearbox, the 2.16m-wide Hobby Optima De Luxe V65 GE will be as much at home on the motorway as it will be down narrow country lanes. As part of the De Luxe specification, a Fiat Chassis pack comes as standard and comprises alloy wheels, cruise control, passenger airbag, daytime running lights, leather steering wheel and gear knob, and pre-wiring for a radio. Our test ’van was also fitted with ESC including hill-hold and Traction Plus including hill descent. Two belted travel seats are provided, in the dinette. Entering the Hobby Optima De Luxe V65 GE through the offside habitation door, one is confronted with a compact lounge featuring a double and single sofa. This area seats five with the cab seats rotated and the dinette table has a movable section to include all members of the party. Daylight enters through a large nearside window, as well as through the skylight above the cab, supported by LED reading lights and a ceiling cluster. Two décor schemes are available: Ashai ash/magnolia (as fitted to our test ’van), or Karelia pine/salamander. The lounge is a comfortable place in which to spend time, and the narrower width of the vehicle doesn’t impinge on the space available. Unusually, the galley is sited on the offside – many Continental producers favour an L- or V-shaped kitchen behind the dinette’s double sofa. With all the galley equipment set out in a straight line, cooks get the use of three gas burners, a sink with mixer tap, and an extractor fan. The cooker and sink lids will need to be closed to provide food preparation space, but the dinette table is close by for backup. Under the sink there’s a 96-litre dual-fuel fridge with ice box, to the left of three kitchen drawers, including one for cutlery. Billed as a two-berth, the Hobby Optima De Luxe V65 GE can be specified with an optional extra sleeping space in the lounge (1.9m x 0.76m), which can be set up and taken down on demand. The permanent sleeping arrangements are at the rear, in the form of two single beds measuring 2m x 0.76m. This sleeping space is accessed via two central steps, and the overall headroom of 1.98m isn’t severely undermined by the height of the beds. A reading light at either end of the headboard is controlled by a considerately positioned switch in its centre. With relatively little space to play with, after accommodating the lounge and longitudinal beds on a 6.74m body length, the washroom has to be a multi-function one – so the shower tray doubles as the washroom floor. Enter through a pleasing domestic-style door to find a swivelling cassette toilet, next to a compact corner sink with mixer tap. Bi-fold and tambour doors are used to keep spray from contacting the non-acrylic surfaces. Up above, next to the shower head, is a retractable line for hanging wet clothes and towels up to dry. The Hobby Optima De Luxe V65 GE’s 548kg payload can be ably spread around the ’van. Users can choose between 15 overhead lockers throughout, plus a large rear garage accessible on both sides of the vehicle. In addition to that, there is a wardrobe under the offside bed, and a dedicated space for shoes in the base of the half-dinette’s single sofa. Standard equipment on the Hobby Optima includes Truma Combi 6kW dual-fuel space and water heating, swivelling cab seats, an LED awning light and electrically operated entrance step, 96-litre fridge with ice box and cold foam mattresses. The De Luxe specification adds even more kit – in the case of the Hobby Optima De Luxe V65 GE you get approximately €11,000 (£8400) of extras! These include concertina cab blinds, habitation door flyscreen, canopy awning, driver and passenger seats upholstered to match the habitation area, heated and insulated waste water tank, tie-downs and 12V/240V sockets in the rear garage, and LED lighting in the wardrobe. Our test ’van was also fitted with the Multimedia Pack, which adds a Blaupunkt navigation system and reversing camera, two extra loudspeakers in the habitation area and a sliding flatscreen TV holder. Individual options include L-shaped seating for the lounge, a section to extend the twin single beds into a double, ‘Montana’ upholstery and the Premium rear panel. With its in-demand floor plan and narrow width, the Hobby Optima De Luxe V65 GE has much going for it. The added extras of the De Luxe spec go a long way towards justifying the £50,000 cost of this imported ’van, but UK buyers miss out on an oven. There are many pleasing touches, though – including the clever gas-bottle tray, all-in-one touchscreen control panel and out-of-the-way kitchen sockets.